By Dr. Eva Sprecher-Uebersax, January 2002. The stridulatory apparatus of stag beetle larvae consists of a pars stridens on the coxae on the middle legs and a plectrum on the trochanter of the hind legs. 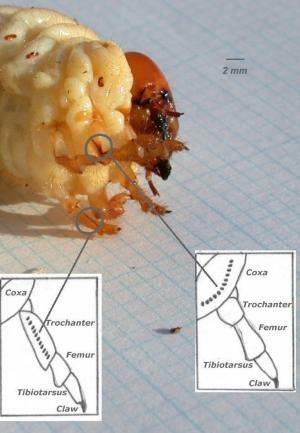 The picture on the left shows a larva (courtesy of Deborah Harvey) were it is clearly visible the darkened area of the pars stridens at the back of the coxa of the right middle leg; see inside the top circle. The darkened area of the trochanter of the left hind leg is also visible; see lower circle. Both circles are linked to boxes showing their respective parts in diagrams of the legs. 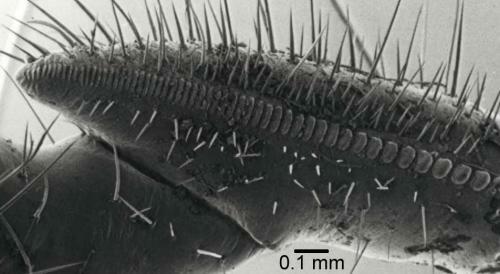 The larvae rub these parts, in their middle and hind legs, together to produce a sound. Please click on the picture get a better view. 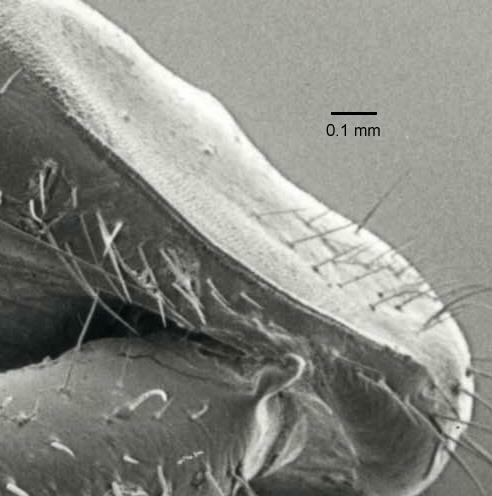 Now lets have a look at some electron micrographs of these legs for a bit more detail. The pars stridens comprises a series of oblong teeth and fields of smaller buttons on both sides of the teeth. They are arranged on the hip side turned towards the hind legs. 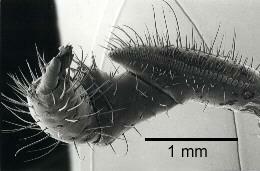 On the left photo it is the ridge visible on the coxa of the middle leg, the biggest segment. Please click on the picture to get a better view of the coxa. The plectrum is composed of a series of ribs. 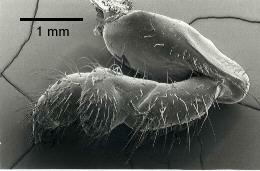 They can be clearly seen on hind leg, shown on the left. It is the row of ribs along the trochanter, the large segment from the right. Please click on the picture to get a bet view of the plectrum. The sound is a very short rattle, which is sometimes repeated once or twice. It lasts about one second and the sound intensity is about 11 kHz. Eva Sprecher-Uebersax & Heinz Durrer, 1998. Untersuchungen zum Stridulationsverhalten der Hirschkäfer-Larven (Lucanus cervus L.) (Coleoptera: Lucanidae). Mitteilungen der Schweizerischen Entomologischen Gesellschaft, 71, 471-479, 1998. The function of their stridulation has remained somewhat unexplained mainly because they have no hearing organs. However, the rubbing of their legs causes substrate vibrations which could be felt by other invertebrates in their vicinity. Therefore, these vibrations could be directed to larvae of the same species for the purpose of holding together and/or expressing claim of space. For example, when a larva is making its pupal chamber, as a warning not to trespass. In fact, this has been observed in captivity by myself. Once an aggressive larva got too close to one inside its pupal chamber. The victim not only stridulated but head-butted as well to signal its presence. It worked. There are other soil dwelling invertebrates which communicate that way. An extreme example is the case of a butterfly who manages to parasitise ants nests by mimicking the queen's acoustic signals . Wolf spiders purr during courtship . Lastly, the deaf percussionist, Evelyn Glennie, plays barefoot. She claims to have taught herself to hear with parts of her body other than her ears.